Schematic drawing of the boron nitride cell. Credit: University of Illinois at Chicago. August 3, 2018 — A new microscopy technique developed at the University of Illinois at Chicago allows researchers to visualize liquids at the nanoscale level — about 10 times more resolution than with traditional transmission electron microscopy — for the first time. By trapping minute amounts of liquid between two two-dimensional layers of boron nitride, the liquid sample can be imaged at extremely high resolution using a traditional transmission electron microscope and spectroscopy techniques. This approach could provide information on the vibrational state of individual molecules. The new technique can be used to follow nanoscale-sized tracers used in biological research, and to visualize processes at liquid-solid interfaces at unprecedented resolution. Using their specialized sample holder, or boron nitride liquid cell, the researchers describe unique properties of water and heavy water at the nanoscale level. They report their findings in the journal Advanced Materials. "While it may seem odd to focus on something as seemingly well-understood as water, there are still things we do not understand when it is confined at the nanoscale," said Robert Klie, UIC professor of physics and senior author of the paper. "So many applications in energy, catalysis, chemistry and biology depend on nanoscale interactions in water, which we haven't been able to visualize using currently available measurement techniques." "Using our specialized cell, we can look at the vibrational behavior of water and begin to explore how it acts in extremely tiny quantities confined within the boron nitride layers," said Jacob Jokisaari corresponding author of the paper and a post-doctoral researcher in the department of physics at UIC. 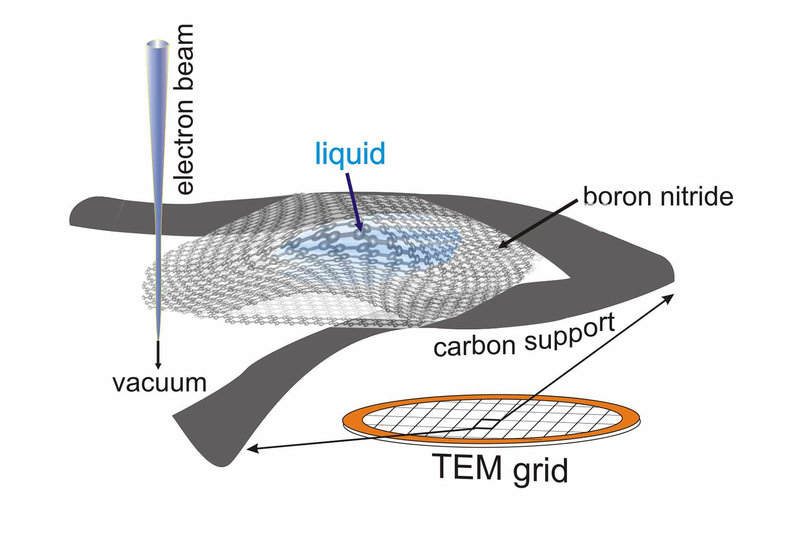 First, the researchers had to solve the problem of how to isolate tiny amounts of liquid in preparation for scanning transmission electron microscopy, which uses a focused beam of electrons to image samples. Normally, samples must be frozen or encased in epoxy and then sliced super-thin before being placed under the electron beam, where the user has just a few seconds to take pictures of the sample before it vaporizes. "We wanted to look at tiny amounts of liquid, and we turned to nanomaterials to encapsulate and support the liquid without affecting the measurements," Klie said. "Because the two-dimensional materials consist of only one layer of atoms, they barely influence the electron beam used to image the liquid, yet they are strong enough to hold the liquid bubble inside the microscope vacuum." After dismissing graphene — the most well-known two-dimensional — as a possible platform due to certain of its properties, the researchers finally settled on nanolayers of boron nitride. This material was able to contain the water molecules and is transparent to the infrared radiation generated by the vibrating water molecules. But progress was slow. "These are extremely tiny and fragile pieces of material —just learning how to hold and manipulate them took months," Klie said. It took almost four years for the team to be able to sandwich water, and its cousin, heavy water, in between the boron nitride layers and get it into position in the university transmission electron microscope. "We could get down to about 350 milli-electron volts energy resolution with our microscope, but we knew we needed better resolutions to measure the vibrational properties of water. We needed access to a better microscope," Klie said. An electron volt is a unit of measurement that can be used to describe the energy of vibrating particles. The team took their boron nitride cell to the Department of Energy’s Oak Ridge National Laboratory in Tennessee, where researchers at the Center for Nanophase Materials Sciences, a DOE Office of Science User Facility, have access to a scanning transmission electron microscope with one of the world's best energy resolutions. Using that microscope, Klie and colleagues were able to see that when isolated in tiny amounts, water behaves differently. "We saw there was a shift in its vibrational frequency when confined in small amounts in our cell," said Jordan Hachtel, a post-doctoral researcher at Oak Ridge National Laboratory and an author of the paper. Normally, water in large quantities vibrates at 420 milli-electron volts, but Klie witnessed that water trapped in his cell vibrated at 406 milli-electron volts. The researchers used the high-energy resolution electron microscope to also visualize heavy water — where instead of two hydrogen atoms bound to an oxygen atom, the hydrogens are replaced with deuterium, which is heavier than hydrogen. Heavy water is often used to tag molecules of interest in experiments. While being able to identify the location of heavy water in cells has been possible, it never before has been visualized with the level of resolution afforded by Klie's new technique. Previous work looks at the electrochemistry of water at a macro or micrometer level, where properties are averaged out over a large volume. But electrochemical reactions appear very differently when examined at a small enough scale. "Measuring how water bonds and interacts with other substances, such as at an interface where water touches something else, or interactions that take place in water such as corrosion of metals, has been impossible at the nanoscale level until now," Jokisaari said. "This work paves the way for the examination of electrochemistry and the atomic level, where theory based on computer modeling has forged way ahead of experimental techniques." "This new electron microscopy technique lets us see physical and chemical processes happening in a liquid environment at the nanoscale level — far smaller volumes than what can be measured by other currently available methods," Klie said. "At such small scales, the behavior of something we think of as basic, like water, changes as individual atomic bonds, local electric fields and the proximity of surfaces begin to affect its normal behavior." Xuan Hu, Arijita Mukherjee and Canhui Wang of the University of Illinois at Chicago; Juan-Carlos Idrobo of Oak Ridge National Laboratory; Andrea Konecna and Javier Aizpurua of the Center for Material Physics in Spain; and Tracy Lovejoy, Niklas Dellby and Ondrej Krivanek from the Nion Company in Kirkland, Washington, are co-authors on the paper. This research was funded in part by National Science Foundation grants (DMR-0959470 and DMR-1626065) and by a grant (FIS2016-80174-P) from the Spanish Ministry.